Happy Thursday! Don't you just love the word "Crisp", I think it's a word that sounds exactly how it is and it also makes me think of late fall with the leaves changing and apple trees ready to have their apples harvested. Since I live in a place with long falls and long springs, crisp is a very word that resign-ates close to home. Since we are coming close to the end of November, the wind has become crisp. I took Nora for a walk in the little woods by my house and all she wanted to do is sit in the leaves and I sprinkled the leaves down on her and she made cooing sounds of pure happiness. I think this is going to be a fall where she starts to remember the difference in the seasons and the holidays. Ohh and guess what? I got a new sketchbook. I have rarely actually finished and used every single page of sketchbook until recently and this is the first page of a brand new book and I can not wait to fill the whole thing up. Want to join in for next week? Next weeks assignment is "Invigorate". :) How ever you want to interpret it. An excellent start on that new sketchbook Erika. Your palette is a mess however. I once had my palette looking like yours. The teacher said my palette looked better than my painting. I should have seen the writing on the wall and switched to knitting right then. I love the word crisp too, congratulations on the new sketchbook too Erika! Ohh.. What a wonderful feeling of having a new sketchbook, and the eagerness to start it painting! Your work is lovely. Have a great weekend. 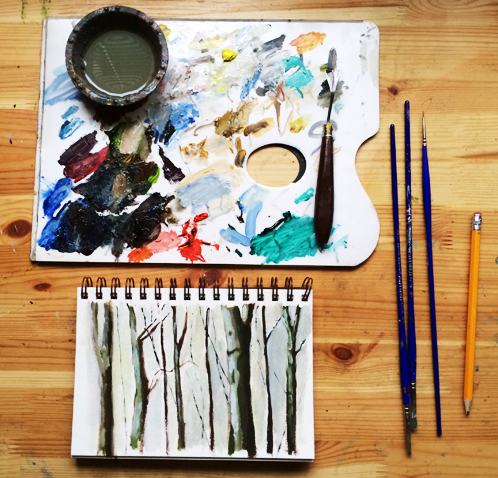 I love bare trees and branches - getting ready to paint a big one of just that...I like your project - may have to think about joining in. Your painting is exactly 'çrisp'! I LOVE that sketch and I love that messy watercolory, painty table too. so lovely and keep it up! i mean seriously the photo is art itself. so pretty!